Cooking a turkey on Christmas Day is a faintly ridiculous idea. If you take an average bird of, say, 6kg in weight, you can comfortably feed at least a dozen people and probably an awful lot more than that. A bird of such colossal size pushes the physical limits of a lot of smaller domestic ovens and tests the nerve of many amateur cooks, terrified of serving salmonella pink turkey to their families. Turkey is thought by many to be fraught with difficulty, even if its reputation is unjustified (cooking turkey is actually easy – it’s just a matter of not overdoing it and letting it rest and relax for a decent period of time once its out of the oven, but more on that next year…). But Christmas dinner is supposed to be a feast, which is why a turkey leads the small pack of centrepieces traditionally suitable for serving on Christmas Day. The sheer size of the average turkey means that there’s bound to be some left, and the annual challenge of using up the rest of the bird has borne some traditions of its own, and my favourite amongst these is the Boxing Day turkey sandwich. I look forward to Boxing Day lunch nearly as much as I look forward to Christmas Dinner itself, and in many ways, the Boxing Day turkey sandwich is a more satisfying meal, especially if you’ve spent the previous day juggling pots and pans, bringing a huge meal to the table at the right time and at the right temperature. The turkey sandwich is stripped of all the fanfare and drama of the main event, but it’s as much a part of Christmas as anything else. OK, to imply that there are any rules at all around making a turkey sandwich is misleading. There aren’t any rules, just personal preferences and your own little traditions. Size – it’s got to be big. Scooby snack sized big. A towering beast of a sandwich, two layers at a minimum. If it needs some sort of impromptu scaffolding made from a skewer to hold it all upright, you’re on the right lines. Bread – white bread, only, toasted on a griddle pan. Brown or wholemeal bread is too heavy here. Turkey meat – dark leg meat is far tastier and generally superior to breast meat. Use it in preference. Chutney – there has to be a liberal amount of some sort of chutney somewhere in the mix, preferably one you’ve made yourself. Whatever you choose, it’s got to be good. Salad – salad is purely for decorative effect. This is a sandwich that’s all about the meat. If it makes you feel better, a few token slices of tomato or cucumber are just about acceptable. Sides – chips are de rigueur. Not potato crisps, North Americans, proper chips – fries, to you. A sandwich like this probably won’t even dent the sides of your turkey mountain. If you’ve got lots more left, you might try these turkey and stuffing croquettes, or this turkey and leek pie, which is easy to put together and hard to beat. Turkey curry is becoming popular, but I’ve only had limited success with that. Whatever you do, though, don’t freeze leftover turkey…it rarely fares well in the deep freeze. Nothing tops a great sandwich. This looks like its up there with the best of them. Dagwood would be impressed. That is a serious sandwich. It looks fantastic. If it wasn't for the fact that we had ham, I'd be all over it. 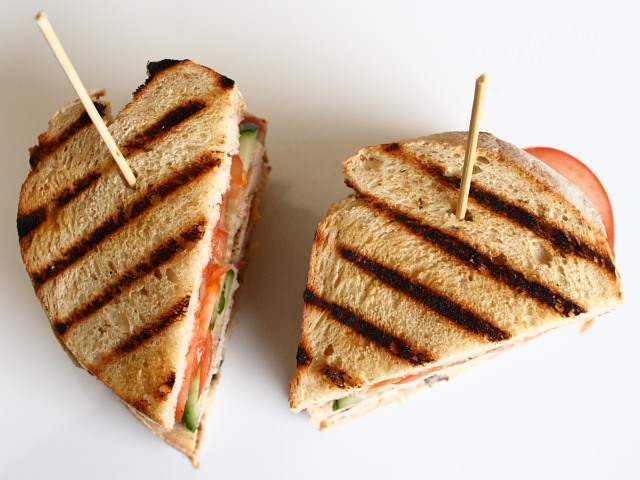 Yay turkey sandwiches…I love your rules, esp. chutney! 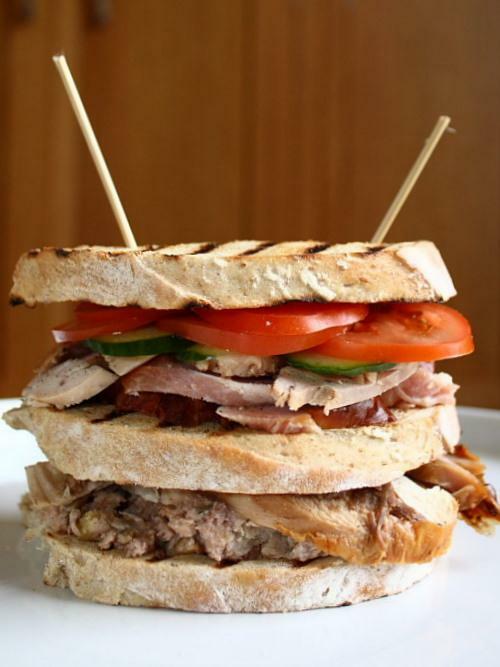 Your turkey sandwich looks like a smaller version of your Christmas feast! such a good idea to use all of your leftovers.